These days all information have to get fluently to the customer. Arrival of the package, delivery status, availability of products and so on. It all gets faster, higher, bigger. But – we’re all just human. 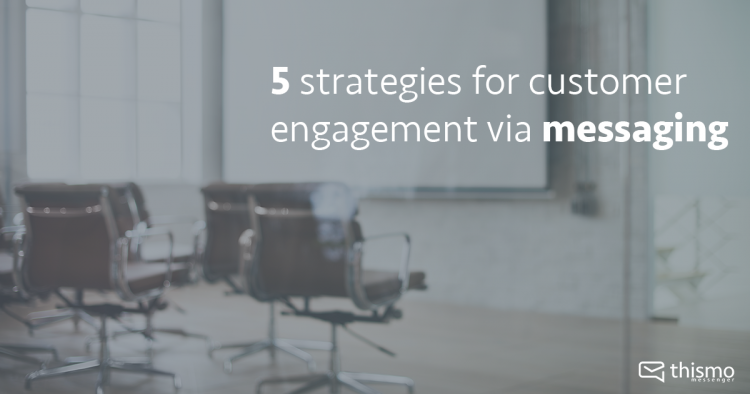 And as long as you are working with humans and not with bots exclusively, we have five strategies to engage with your customers to satisfy them. Customers will remember your service a lot longer than they remember the price. Be kind, show interest and they will come back! If something doesn’t work most of them are already frustrated when get in touch with you. Don’t take it personal. Just make them happy again.Your customers will feel like king when you surprise them with a special support. With messaging you won’t be the last drop that causes the glass to overflow. It’s quite easy even when they ask for your support twice – when you use messaging. You’ll have all information and the conversation saved. Just, please, please, please don’t force your customers to call you and then listen to elevator music and smooth jazz while stucking on hold. The key about messaging is – it’s no problem if you can’t answer right away. They get a push notification when you answered the request. Nothing is more valuable than acquiring feedback from your customers. And keep this in mind: It is 6-7 times more expensive to acquire a new customer than it is to keep a current one. If you don’t know you’re doing something wrong or your customers are dissatisfied how can you improve your service? Go for really specific questions to get the highest value out of your customers answers. As already mentioned, your customers want all needed information fast and with easy access. Give your customers always the opportunity to see all the information of their order in detail and let them easily get information about the current state of the delivery. Just send the order confirmation and the tracking code to your customer via message after they placed an order on your website. Invite your customers exclusively to an event, share discount codes or new products. There are no limits set! Use the opportunity you’ll have with messaging – a direct and especially personal connection to your customers. Meanwhile there are a lot of messaging services out there. But, which one is perfect for your customers? They all are! With our thismo messenger business gateway you’re able to manage different messaging services at once. Sort of all-in-one customer messaging service. Your customers chose their favorite messaging service to connect with you and you answer every message from thismo messenger. It’s that simple. Want to know more about thismo messenger? Just message us right away!